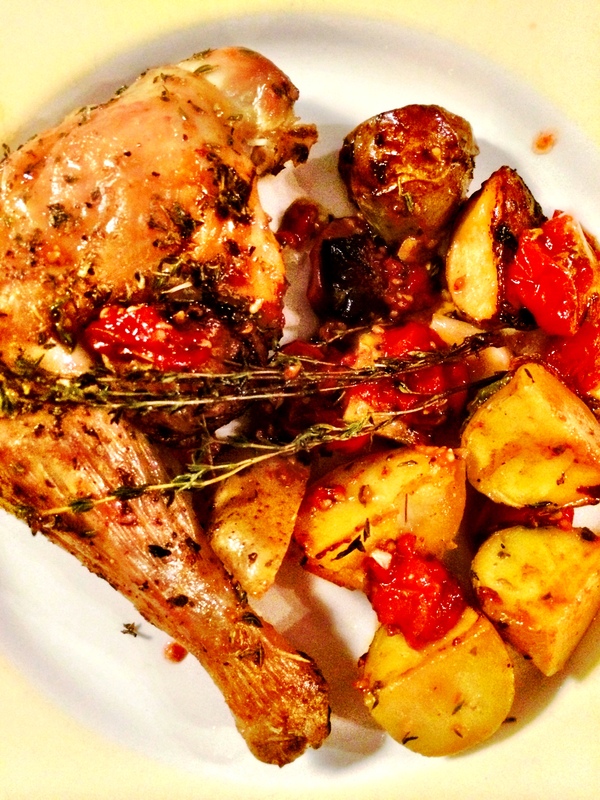 Sometimes, nothing is more comforting than a simple herb roasted chicken. While traveling through Spain on a road trip, a friend and I ended up in the picturesque medieval town of Miravet in Catalonia. We arrived on a Tuesday afternoon after a few days of feasting on Pintxos in San Sebastian, and were ready for one final meal before flying out. We quickly found out that all of the restaurants were closed. Overhearing us, the Spanish couple next to us at the bar offered to cook us dinner at their home. “Seriously, we’re chefs.” Why not. We asked what they were cooking; the man replied he had a whole chicken in the fridge. That’s how we ended up at a rustic home in the Catalan mountains, with two Spaniards, a Croatian, and two Pakistanis, drinking wine and eating a perfect roast chicken, potatoes, and salad. It may have been the best meal of the trip. The recipe below reminds me of the dinner Jose and Lola cooked for us. It is fairly simple and results in crispy skin, and juicy meat. Use this when you have a chicken in your fridge, and some last minute guests over for dinner. Preheat the oven to 450F degrees. Butterfly the chicken (this helps the chicken cook more evenly). If you have never butterflied a chicken, you need to remove the backbone, and then break the breast bone with the pressure of your palm, so the chicken lies flat. Cutting out the backbone takes a little bit of practice, but once you know where to cut it won’t be too difficult. 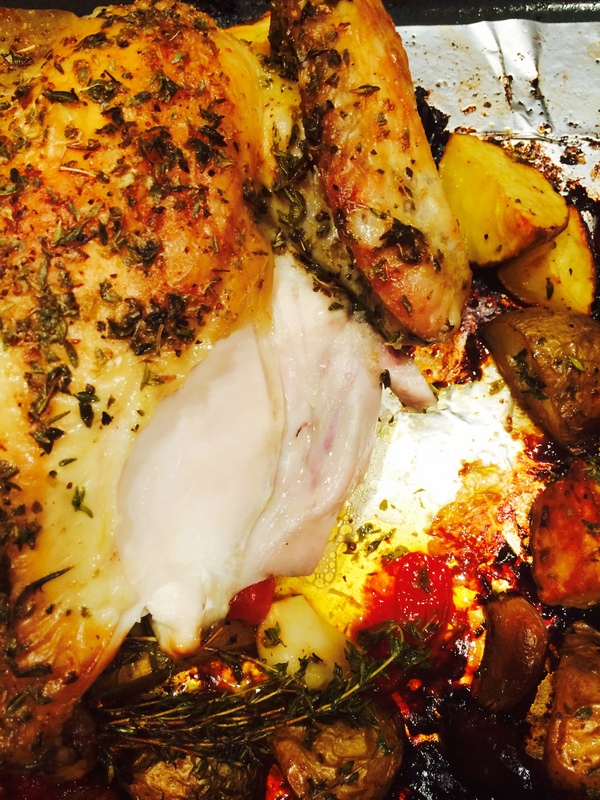 Once butterflied, pour the melted butter over the chicken, and sprinkle on the herbs. Make sure each part of the chicken is covered, and season generously with kosher salt and ground black pepper. Mix the tomatoes, garlic, and potatoes with enough olive oil to coat, and season with salt and pepper. Line a baking dish with tin foil (this makes cleanup much easier), and arrange the vegetables in the center. Place the chicken on top, breast side up with thighs also facing up. Try to tuck as many vegetables underneath the chicken to keep them from burning, but a little browning is good and builds flavor. 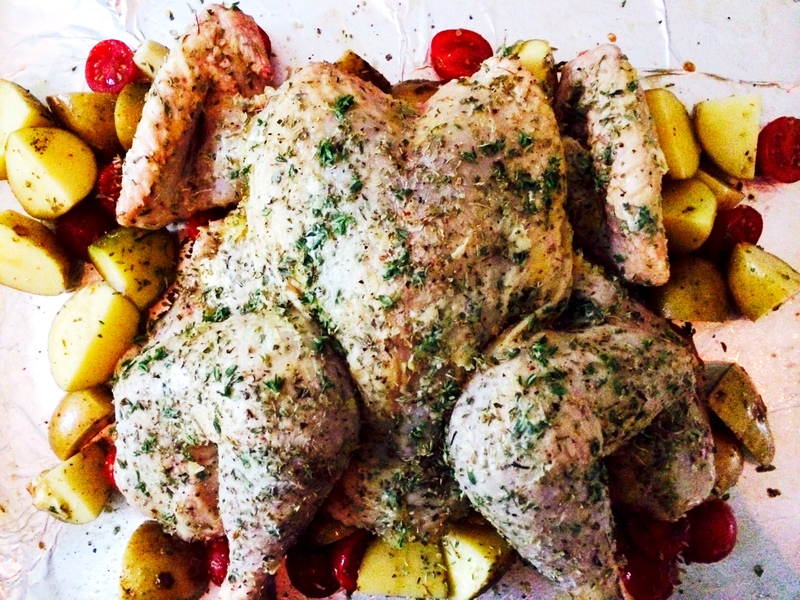 Place a few sprigs of thyme underneath the chicken as well. Roast in the 450F degree oven for about 20 minutes. 10 minutes in, remove the chicken and give the vegetables a quick stir. Reduce heat to 330F degrees and roast for about another 45 minutes. If your chicken is larger, you may need to keep it in the oven a little longer (until the chicken reaches 165F degrees). Remove from the oven, and serve individual chicken pieces with some of the vegetables, and a few squeezes of fresh lemon juice if you wish.